Hakusan, Japan, February 25, 2015 – EIZO Corporation (TSE: 6737) today announced the release of the RadiForce RX850-AR and RX650-AR – 31.1-inch and 30-inch medical monitors with anti-reflection coating that greatly improves image clarity. 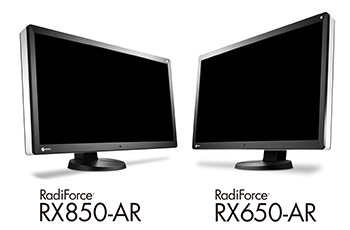 Based off of the RadiForce RX850 and RX650 multi-modality monitors, the new models offer all of the same features, such as a streamlined workflow and exceptional image quality, with the added benefit of anti-reflection (AR) coating, a type of optical coating that greatly reduces the amount of glare caused by ambient lighting. AR coating offers a more vivid display of images on LCD monitors compared to more commonly used anti-glare (AG) coating. AG coating applies a small, uneven texture to the monitor’s screen that diffuses ambient light in order to reduce glare. However, the light emitted from the monitor’s backlight is also inadvertently affected, causing a loss in image detail and black areas to become washed out. EIZO’s unique AR coating maintains image sharpness using a method that allows the light originating from the monitor to pass through the screen without being diffused. This method greatly reduces reflections from outside light while ensuring that the monitor continues to display crisp images. AR coating allows medical professionals to see the deeper blacks and subtle details in digital mammography, X-ray, and other high-resolution images with exceptional clarity in multi-modality environments. The RadiForce RX850-AR and RX650-AR are now shipping. Date of availability may vary by country so please contact the EIZO group company or distributor in your country for details. EIZO (TSE:6737), which means image in Japanese, is a visual technology company that develops and manufactures high-end display solutions. EIZO integrates hardware and software technologies with consulting, web hosting, and other services to help customers in business, graphics, gaming, medicine, maritime, air traffic control, and other fields work more comfortably, efficiently, and creatively. Headquartered in Hakusan, Japan, EIZO has R&D and manufacturing facilities in Japan, China, Germany, and the US, and representation in more than 70 countries.